Save “ebLabs_codePuncherPro.py” to your maya/scripts/eblabs/codePuncher folder. Add the following command and icon to a shelf button (or hotkey). An advanced scripting tool set geared towards versatility and function within Maya. Useful for both technical artists, and non-technical artists. Manage, Access and Share any number of code snippets. Non-destructively modify scripts on the fly. 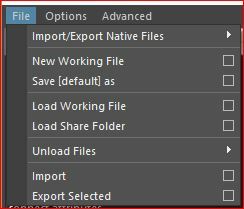 Easily Import/Export code from existing script editor tabs, or external files. Use Searching and Tagging to quickly find any script. Modularize your coding by mixing and matching code snippets. If you have a number of tabs in the script editor, this will import them in bulk into Code Puncher. Import native .mel and .py files into Code Puncher. Export the selected Code Puncher code snippets as native .mel and/or .py files. When migrating from the previous version of Code Puncher, use this to convert your working files to the new format. Code Puncher stores many code snippets into working files. By default a working file called ‘default’ will be generated for you. Create new ones to organize and manager your code snippets. Rename and save your current working file to something else. Load an existing working file into Code Puncher. Folders can be used as a code repository, simply save your working files into a folder. When you load a Share folder, the working files will be loaded as Read Only. You can Load a working file from the Share folder if you would like to make changes to it. Use this menu to remove Working files from your Code Puncher. This does not delete anything, simply removes it from the list of working files that Code Puncher uses. Same idea here, simply removes a share folder from Code Puncher. Import code snippets from another Working file into the current active Working file. Export the selected code snippets to a new Working file. Thanks for visiting ebLabs, a technical site from artist Eric Bates focusing on tools for creating Computer Graphics and Animation.